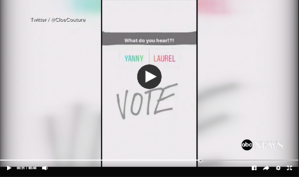 The world has been debating whether a simple computer generated sound clip is saying the words Laurel or Yanny. Which do you hear? It is amazing because roughly ½ the people say it definitely says one or the other, and it simply can’t be anything different. I personally heard Laurel and so did my wife, but friends at work definitely heard Yanny. Honestly, I could not understand this at all. No matter how many times I listened to this recording, all I could hear was Laurel. I could not hear Yanny even in my wildest imagination. There were L's at both ends of the word…it was Laurel! Being curious, and having my undergraduate degree in engineering, I was pressed to find the answer and reason why this phenomenon was happening. I went to a site that played the voice clip at lower and higher frequencies, and the amazing thing was I heard Yanny when the frequency dropped in pitch. Apparently, that is the entire debate wrapped up; what we hear is dependent upon the pitch and what we are attuned to hearing. I suddenly heard Yanny for the first time today, and surprisingly enough I can sort of hear Yanny at different pitches. It’s almost like the optical illusion of “Do you see two people kissing, or do you see a butterfly with its wings outstretched?” You know, the type of brain twister that you can only see one of two ways upon first look. It just so happened this week we have been going back and forth with a client that keeps saying one thing and yet we keep hearing something else. We would respond in writing and we were certain they were missing what we were saying. Everything seemed to take on a bit of an adversarial interpretation when we were trying to be positive, which I believe our client was too. It was only when someone different in our organization wrote someone different from their organization that suddenly we both heard the same thing: Teamwork! We joked it was almost like the Yanny vs Laurel debate. No matter what we said, they heard something else and vice versa. We decided to look up the profiles of the people involved and sure enough, different styles. We originally had a high I writing to a high C, and then a D was writing back for an S style to answer. Laurel vs Yanny! The high C wanted to hear about a specific process that the high I was trying to explain we could do in many different ways. They wanted to hear one way; the way that worked best for them! They didn’t hear all the different ways it was possible, because they were listening for an answer to what they asked for in the process of things. Their frustration lead them to having a D on the team write to someone else in the office who was a high S that only heard frustration. Yanny vs Laurel! Finally, when we all got together and started talking, it was clear. We had the answers, they wanted the solution, and we both started hearing both Yanny and Laurel. If you experience people in your office, home, or in your life in general are always hearing Laurel when you are saying Yanny, you might want to consider using DISC assessments. Even better, we provide training and certification courses in behavioral analysis so you can teach everyone to hear both.